The weather for this Saturday (March 9th) looks ominous and would certainly decrease the attendance at our planned meeting. As a result, the Board of Directors has decided to postponed the meeting by one week to March 16th. Fortunately, we can use the same room and our speaker is available on that date. So we will have our meeting (including the Board meeting) on March 16th at Hennepin Technical College in Room in B-120 (regular room). The Board meeting will be from Noon to 1:00 PM with the speaker to follow. Stay warm, stay safe, and plan to attend our MN-NARGS meeting on March 16th. Please note that the January meeting has been moved from January 12th at Autumn Grove to January 19th at Hennepin Technical College! Our speaker will be MN-NARGS member, Rick Rodich. Rick holds a B.S. degree in Horticulture/Botany from the University of Minnesota, and possesses a wealth of knowledge and experience growing all types of plants. 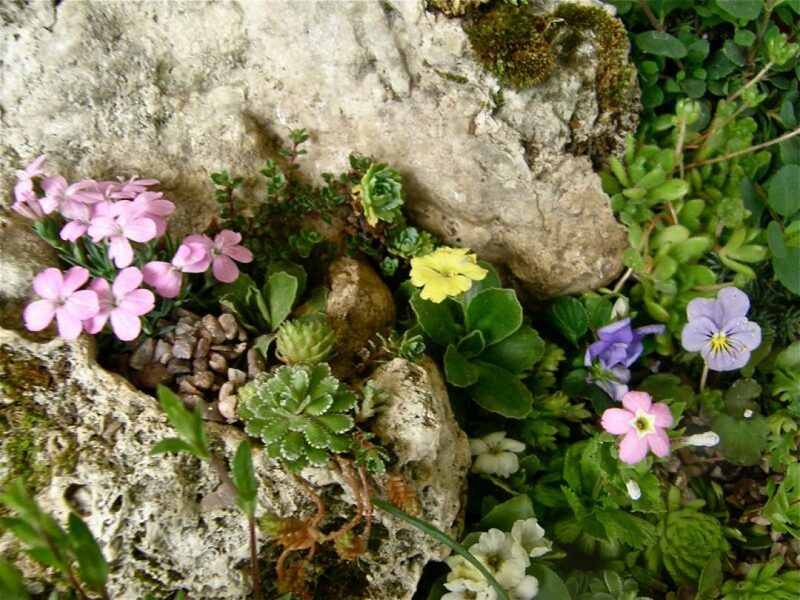 Soil and water may not sound glamorous, but if you want to be a successful gardener growing alpine and other rock garden species, then you cannot have enough information about these two topics. The interplay between soil and water is critical to plant growth and reproduction, but also for plants susceptibility to extreme temperatures, insects and diseases. We cannot control the weather, but in a climate like Minnesota, providing the proper below ground dynamics can make all the difference between success and failure in growing something new. If you dream of expanding the variety of plants you can grow (honestly we are all in dreaming mode this time of year), then come learn from Rick how you can give your new plants the best chance of thriving for many years to come. The plant sale is rapidly approaching! Please see the new time on the calendar. Members, now is the time to start put those extra divisions or seedlings in pots to bring for sale. We always have a wonderful selection of plants for both small space and traditional gardens, including alpines, rock garden perennials for sun and shade, grasses, annuals, hosta and shrubs. Members with extensive gardening expertise will be available to ‘Ask a Rock Gardener’ – stop by and go away with new plants and knowledge! Saturday, June 2nd, from 10 AM to Noon. We will be at the Jaycees Pavilion at Central Park in Roseville. The April 14 meeting is cancelled due to weather. The Hennepin Technical College will be closed also. It’s unfortunate that we won’t be able to listen to Deb Kvamme’s sage propagation advice, as she would have been our speaker. Being so close to spring (although that almost seems like wishful thinking), rescheduling for a May meeting is not a viable option. Our next get together will still be our garden tour, Saturday May 19. Stay warm and think SPRING!! Lakewood Cemetery is offering behind-the-scenes tours of their greenhouse operations and a take-home planting opportunity as an Earth Day Celebration. Lakewood, located in south Minneapolis, is one of the only cemeteries in the country that still maintains a full-service greenhouse operation, and this event marks the only day of the year that the greenhouses are open to the public. The event takes place, Sunday, April 22nd, from 10:00 a.m. – 3:00 p.m., with the grounds open for self-guided tours from 8:00 a.m. – 8:00 p.m.
You can learn more about the event at https://www.lakewoodcemetery.org/single-post/2018/02/27/Earth-Day-Greenhouse-Tours-Planting-Day. The greenhouse tours at last year’s first annual Earth Day Celebration sold out very quickly, so this year they have added many more tour times, but act fast if you are interested in attending this event. The annual banquet is just around the corner! Joseph Tychonievich will be speaking on Re-imagining a Classic Rock Garden Style. Joseph is editor of the Rock Garden Quarterly journal and author of two rock gardening books. He will share his visits to traditional and ‘re-imagined’ rock gardens across North America, while presenting a distinctly optimistic view of the next generation of rock garden enthusiasts. We will meet on Saturday, March 24th from 5 PM to 9 PM at the Sheraton Minneapolis West Hotel (Ridgedale Sheraton) , 12201 Ridgedale Drive, Minnetonka, 55305. Please contact Doug Root at doroot@me.com or 651-697-9183 to RSVP!